Sabangan, Mt. 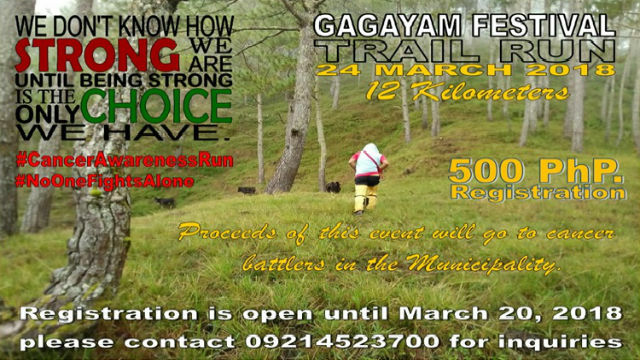 Province – The Gagayam Trail Run that will be held on March 24, 2018 will serve as one of the highlights of celebration of 12th Gagayam Festival on the 21st-24th of March by the Municipality of Sabangan, here. This cancer awareness and environmental awareness run will be a 12km run for a cause, done along one of the tourist spots in Sabangan- the “Spanish Trail”. This is purposely to support the battlers of cancer in the Municipality, refueling hope and making them feel that they are not fighting alone. It also gives awareness to the very alarming effects of climate change and destructive forest fires in the locality. Aside from the cancer awareness, it will also promote the Spanish trail to the locals and foreigners who will attend the festival. Participants to the event will find this run and walk in the mountains a chance to revitalize and be in one with nature away from daily routines. The “run for a cause” starts from the elevated green mountain of Sitio Pakya, Poblacion, following the route of the Spanish Trail (1,723m above sea level, seeing the distinct wonders that the view will offer); then Mount Tubo (picnic area of the people in Upper Sabangan and tourists) of Barangay Bao-angan; going down to the roaring water of the Chico River (longest river in the Philippines with length of 174.67km) through Barangay Bun-ayan; and ending the run following the river stream to Barangay Poblacion reaching the finish line at the Municipal Hall. The route will be marked with ribbons that will be placed along the trail. Organizers are asking the running public support the activity to become succesful, emphasizing its objective to help people that are in need the most.